All Aboard for Cruise Season! Full steam ahead for the Cruise season in Vancouver! It’s that time of year where those big and brilliant boats can be seen in the Vancouver port as lucky cruisers create a stream of disembarking from great adventures or boarding for adventures soon to come. 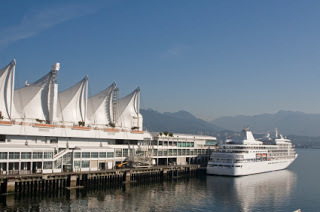 Taking a private charter from the Vancouver Airport (YVR) or your Hotel to or from the Vancouver Cruise Pier at Canada Place is an easy and most convenient way to go. And whatever you do, taking a bit of time to tour the beautiful city of Vancouver before you board your ship or after you disembark is highly recommended. A short 2 to 4 hour pre-cruise or post-cruise tour would allow you to see such great sights as Stanley Park, Gastown, Chinatown, the shopping hub of Robson Street, perhaps English Bay’s beachfront, the award winning Vancouver Convention Centre, and Granville Island’s Public Market. So if you’re a lucky cruiser this season, let a tour of Vancouver be the cherry on top of your travels! We declare Cruise Season officially open! Those big beautiful boats are starting to roll into Vancouver’s harbour and we await you. Shuttle buses, Limobuses, Sprinter Vans and SUV’s for private charter from YVR or your Hotel to the Cruise Pier as well as Cruise ship pickup to your chosen destination. Wanting to tour some of Vancouver during your transfer? We’re happy to customize a short tour or all-day adventure for you. We can simply drive through some local hot spots or make a stop so you can do some exploring.